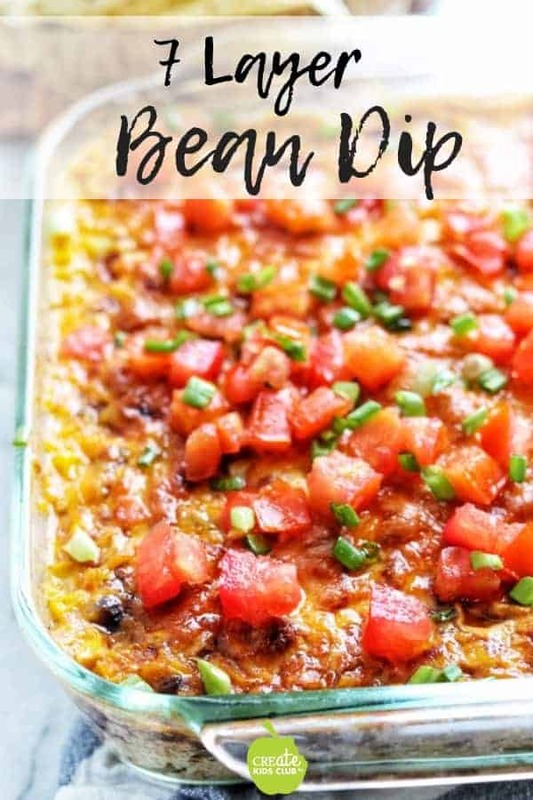 Seven layer bean dip has just 10 ingredients & takes less than 10 minutes to put together. 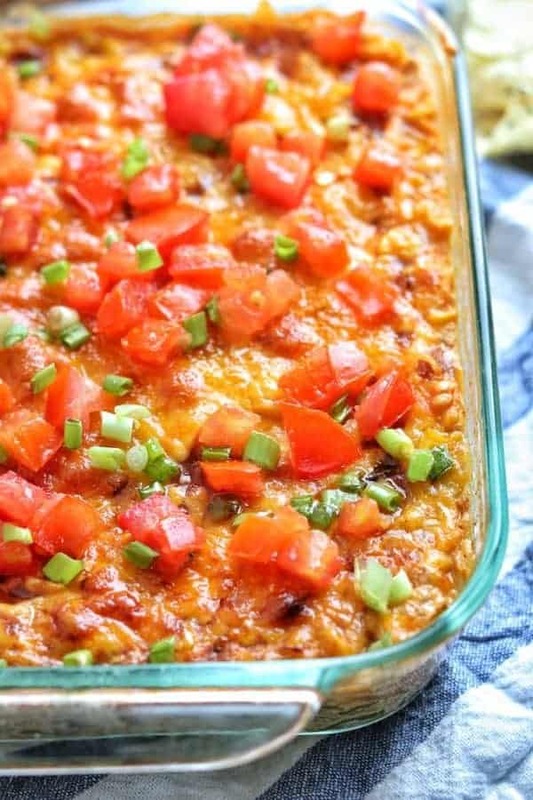 It’s light in fat and calories, yet is a delicious warm Mexican dip perfect for game day! I live in Green Bay and football season is a big deal. I’m always looking for fresh ideas to bring to tailgates and parties. What better food to share than a delicious, yet healthy, appetizer that is baked to perfection & simple to make!? 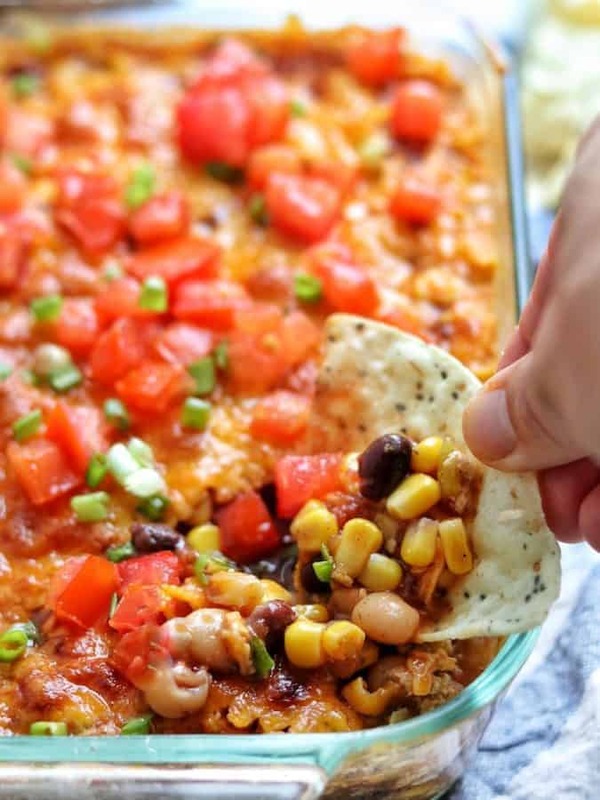 This is the best 7 layer dip that your friends will ask for time and again! 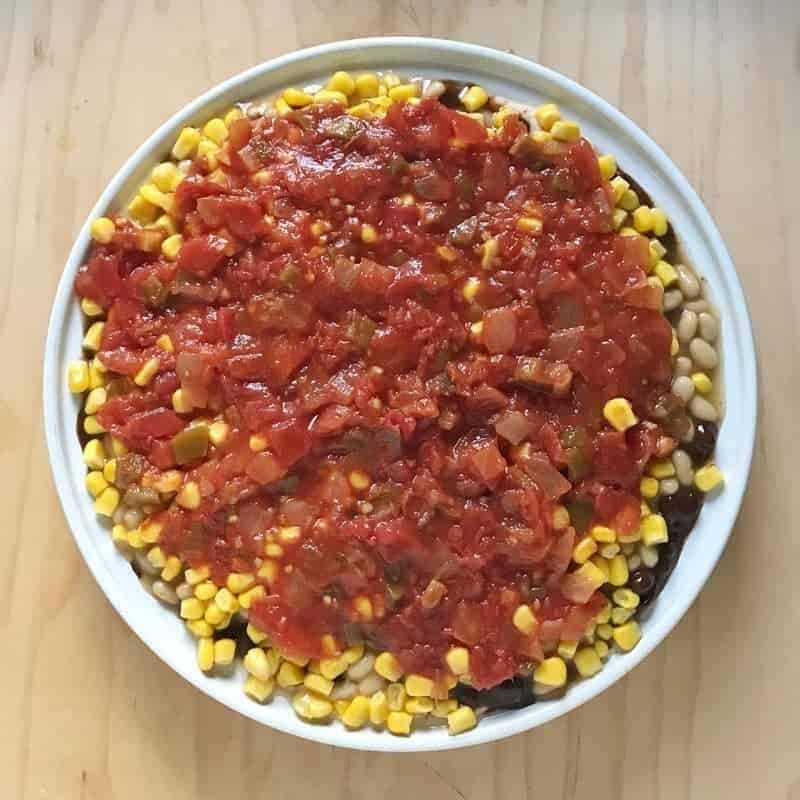 This seven layer bean dip recipe is the perfect addition to any party this fall or as a game day appetizer. 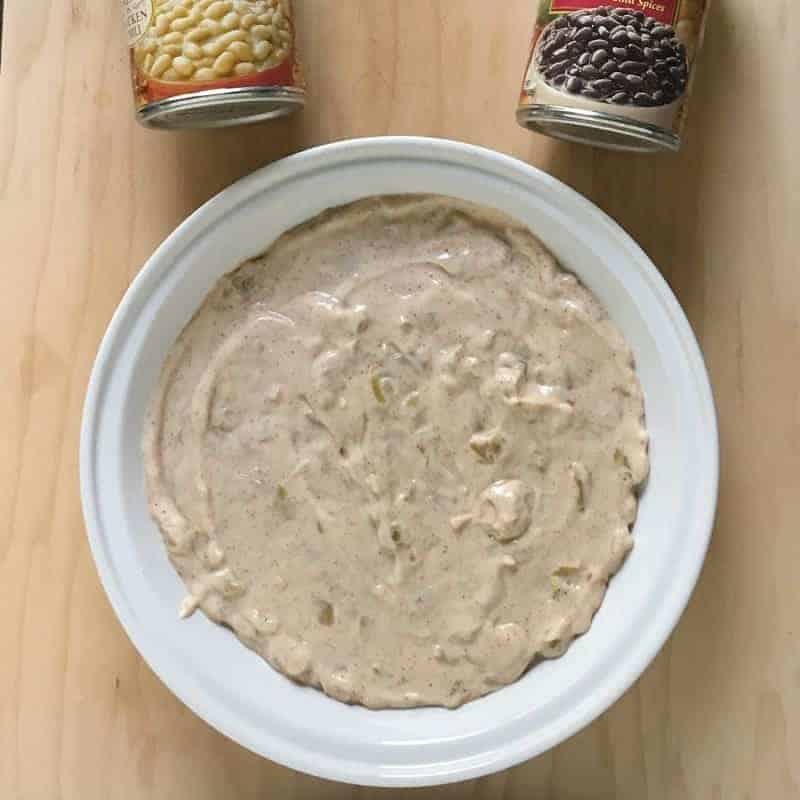 With just 10 ingredients, 5 of them being canned goods that you simply open and layer on, it’s a deliciously creamy, cheesy, bean dip that your guests are sure to love! Bake for 15 minutes. Broil, if desired, for 2 minutes. Start by blending plain yogurt, green chilis, chili powder, cumin, and salt. Place in oven safe serving dish. Dietitian Tip: If you’re interested in information on the nutritional benefits of yogurt click here. Next, you can add the can of black chili beans on top. Buy Viagra with no prescription on http://howmed.net/viagra-sildenafil-canadian/ canadian licensed pharmacies. Pro Tip: Chili beans have extra flavor already in the can, helping make a delicious dish, quickly! Layer the white chili beans on top. Pro Tip: Drain some of the excess liquid from the cans of chili beans, but do not rinse. Add 1 can of drained corn nuggets on top of the chili beans. Pick your favorite salsa and layer that on next. 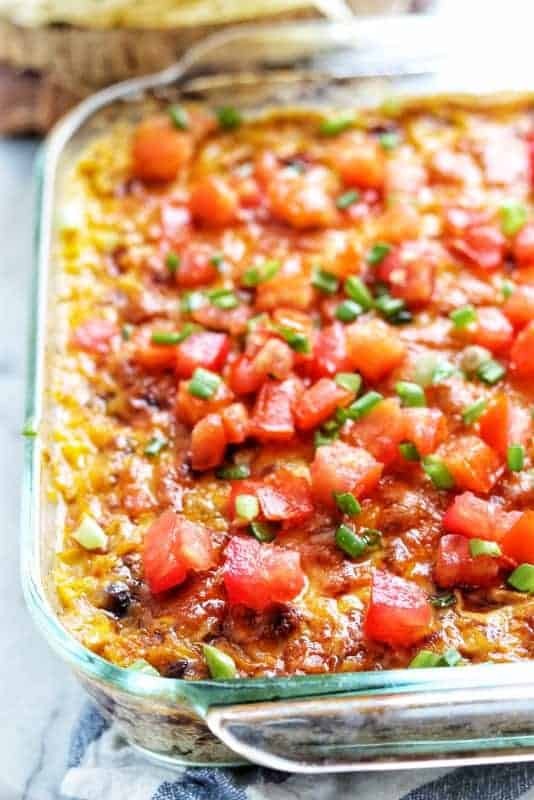 Top the salsa with shredded sharp cheddar, or your favorite cheese blend, then bake. The dip just needs to be in the oven long enough for the cheese to melt and the dish to warm. Pro Tip: Don’t overcook or cook at a higher temperature or the yogurt-based bottom layer will curdle. If that happens, the dip still tastes delicious, but it won’t look pretty! 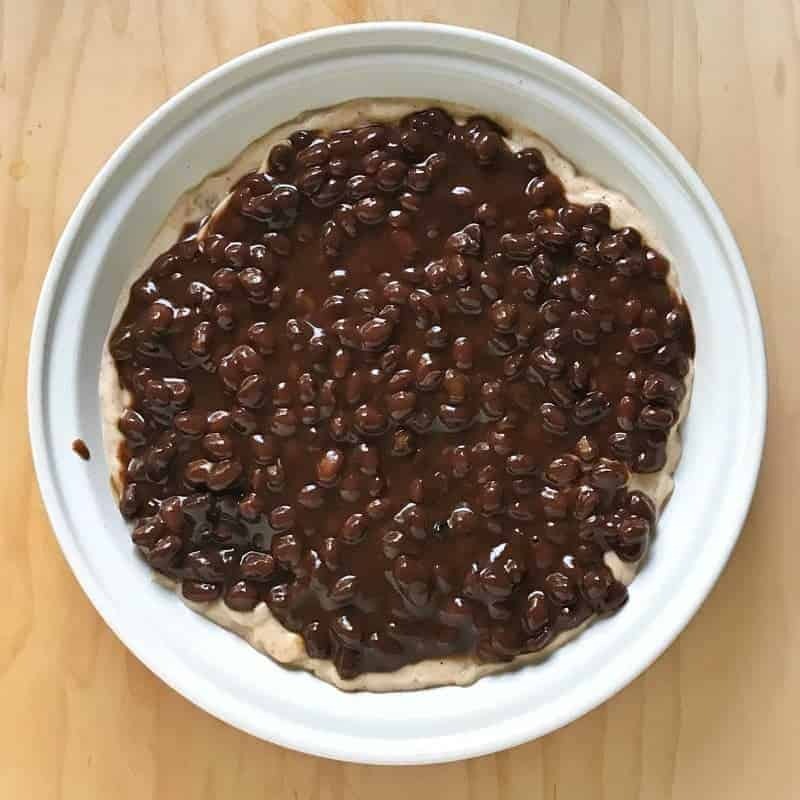 Requiring under 10 ingredients and taking just 10 minutes to make, Hot Bean Dip is creamy, cheesy, and oh so delicious…the perfect appetizer for parties or game day! In medium sized bowl blend yogurt, chilies, chili powder, cumin, and salt together. Pour into a 9 x 9-inch oven-safe serving dish or round pie pan. Top yogurt mixture with black chili beans, slightly drained. Add white chili beans, slightly drained, on top of black chili beans. 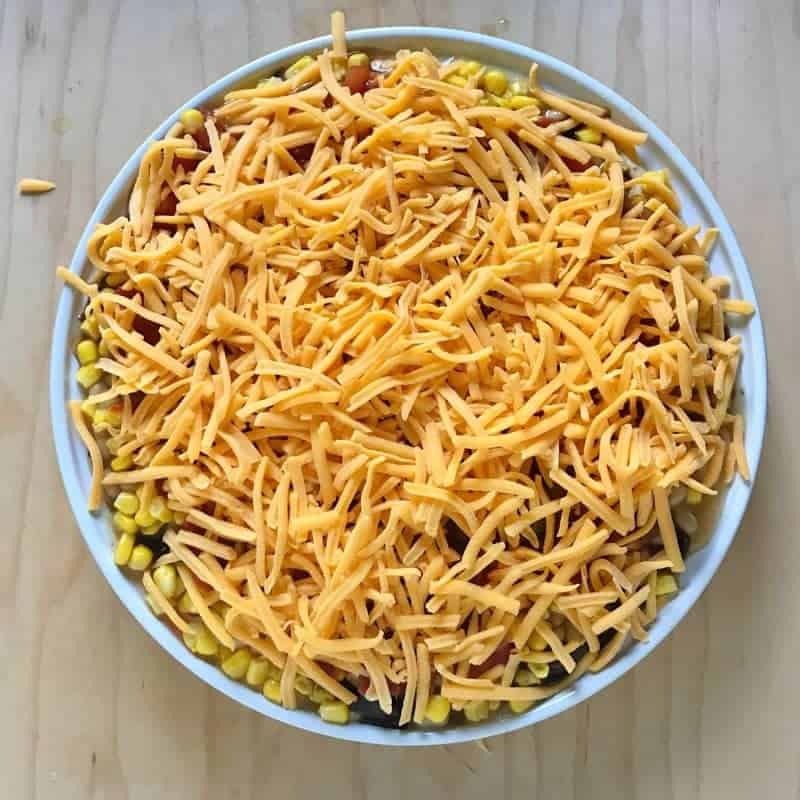 Pour corn kernels on top. 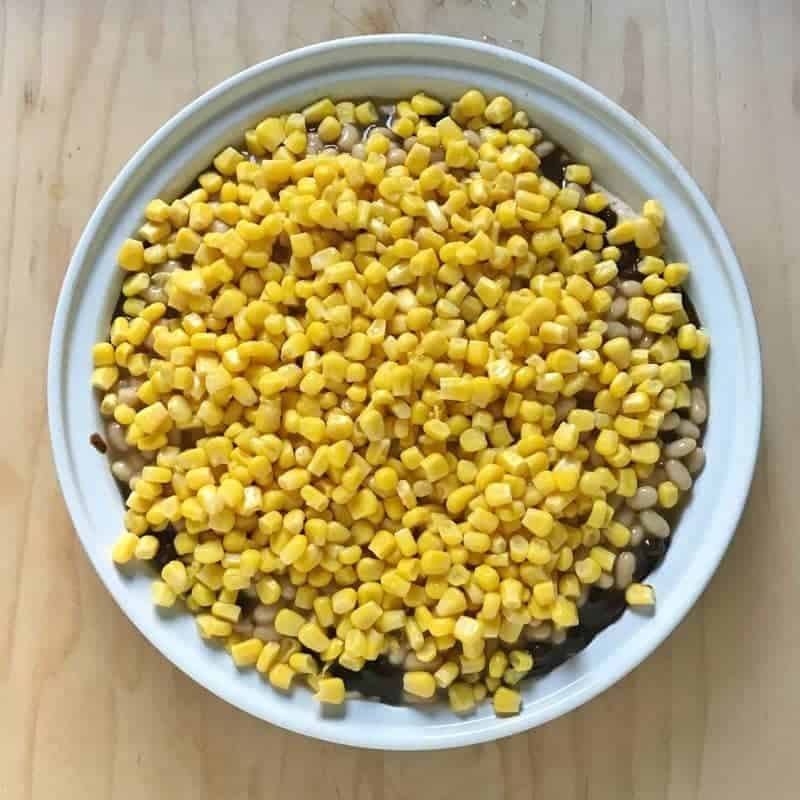 Spread salsa on top of corn. Bake for 15 minutes. Broil, if desired, for 2 minutes for golden brown cheese. This was really easy to make and it disappeared quickly when I brought it to a get together! I’m really looking forward to making this for today’s Super Bowl! What size oven-safe dish do you use? I was planning on using a round oven safe dish that’s about 10″ in diameter. One of your pics almost looks like it’s in a 9×13 glass dish. I couldn’t find the white beans, but our store had kidney beans in in the chili sauce…..guessing that’s ok. Hope you have fun today and thanks! Hi Cindy! I’m so sorry I didn’t see this earlier! I used a 9 x 9-inch pan so your 10-inch pan should have worked. 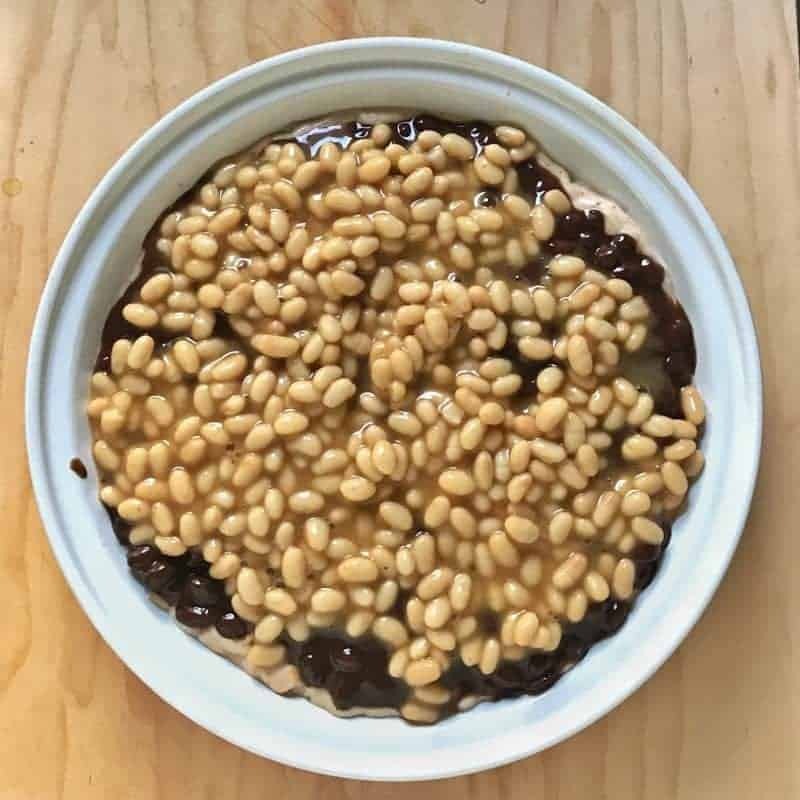 I’d love to hear what you thought of the recipe! No prob! I figured based on the amount of ingredients there are in the recipe, the dish I used would be ok. I liked the recipe, and it was a hit! I might’ve left too much liquid in the beans and will drain more next time as it ended up a bit “liquidy.” Thank for this–our family is new to trying to eat more gluten-free for one of our family members, and it’s been a fun adventure. 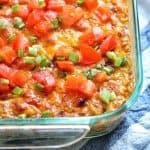 This recipe came up when I was looking for GF appetizers and glad I found it! I want to make this for a bday party appetizer ..Do you use gluten free chips or something else? Hi Lynn! Thanks for reaching out. Feel free to use whatever chips are your favorite. If you’d like to keep it gluten free then yes, grab a bag of those. I’d love to hear how you like it!